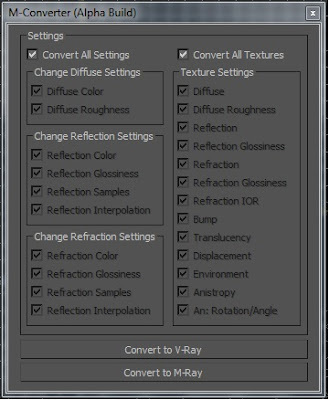 I made a Material Convert that converts Arch & Design materials to Vraymtl. I created this in my free time so its a BETA script. For now M-Converter only converts Arch & Design materials to Vraymtl. I hope you guys like this script. Vray must be installed in order to run this script. Submitted by satheesh on Wed, 2011-05-04 01:06. There is no installation for this script. Visit the "Download URL" and submit the BETA form. M-Converter will then be send to your E-Mail. It will be a "Rar" file. You can then extract it wherever you want and execute it through Maxsript--> Run Script. Submitted by JokerMartini on Tue, 2011-05-03 13:07. Where is the script after installing?